After following the recent news regarding Mundine’s fight leading up to and after his defeat I’ve realized that Anthony Mundine is either very smart or very, very dumb. Let me explain. Even the most casual boxing fans will know that there is another boxer with a big mouth that says things that tends to get on people’s skins and piss people off. This boxer is hated by a large part of the country with his controversial opinions… and he is the same race as a disadvantaged minority. The boxer that I’m referring to is Floyd Mayweather. One other thing that Floyd Mayweather is known for, besides his big mouth is the fact that he was the highest paid sports person of 2012 (and yes, that includes Tiger Woods). Athletes like Floyd Mayweather and Anthony Mundine choose to hold (and express) opinions that simply piss people off and make them unpopular which means that they forego the big bucks that come from sponsorship deals. Nike, for example, would never sponsor Anthony Mundine or Floyd Mayweather because it stands for something, such as sportsmanship. And blowing bubble gum in people’s face during weigh-ins I’m guessing is not an example of the sportsmanship that Nike stands for. However while Anthony Mundine and Floyd Mayweather lack income coming from sponsorship deals, they make it up in the PPV (pay per view) numbers from people who pay to see them get knocked out. So is this an effective strategy? Well let’s look at the facts, in the year 2012 Floyd Mayweather only had 2 fights – one against Victor Ortiz and one against Miguel Cotto in order to make up his $85 million income. That’s it. So not counting training we’re talking about less than 1 hour in the ring. Which at $85 million divided by 60 minutes comes at a total of over $1.4 million a minute. He earns more than I do. The second highest paid boxer earned $36 million and had 3 fights. Even with all his endorsements he is not earning even half of what Mayweather is pulling in. 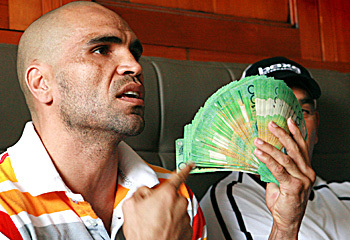 Anthony Mundine is basically the Australian version of Floyd Mayweather. People that are on Anthony Mundine’s Facebook page hating on him and really anyone that expresses a negative opinion are just doing what he wants. Let’s be honest, how many people would care about a Geale fight if it wasn’t for Mundine and their need to see him knocked out? So now that we know that being hated is good for business when it comes to boxing, are you really surprised that Mundine made the statement about Advance Australia Fair leading up to the fight? Do you really think Mundine cared that his opponent is not a full Aboriginal and that he’s dating a white woman? Is it a coincidence Mundine is running his mouth leading up to the fight? Mundine is a great marketer, and he knows exactly what to say to pick the sensitive bone of Australians and get them riled up. As this post that has over 100 comments on news.com.au can attest. Or maybe he’s just dumb.